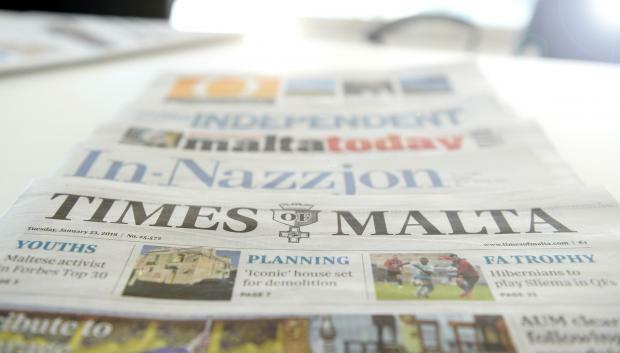 The following are the top stories in Malta's newspapers on Wednesday. Times of Malta reports that 'reverse' road works are being carried out on country roads around Rabat. It also reports from court how a comment by the man charged with the Għaxaq double murder that the victims were scared but he did not know why raised suspicion. MaltaToday focuses on road accidents, saying they have become 'an epidemic'. It also says that Alex Sceberras Trigona, a former foreign minister and now government adviser, met a Russian minister after Malta turned down a Russian request for overflying rights for flights to Venezuela. In-Nazzjon quotes PN leader Adrian Delia saying the government is ignoring families and is intent only on power. It also reports that the health minister refused to disclose how many foreigners are working in the health sector in Malta. l-orizzont says the new EU Work-Life Balance Directive will be followed according to local reality.